In epic Ramayana, Lanka plays an important role in shaping the story. The abode of the King Ravana is described as an island with homes and palaces made of gold. Rama’s army built a bridge on the sea to cross over. They finally defeated Ravana and took Sita home. Look for best time to visit Sri Lanka and plan your Ramayana trail. Lanka is today known as the modern Sri Lanka. Every year millions of Hindu devotees visit Sri Lanka to pay their respects. Among all the things to do in Sri Lanka exploring the locations where events of Ramayana took place is an amazing activity. There are several places of key value to do the Ramayana trail in Sri Lanka. 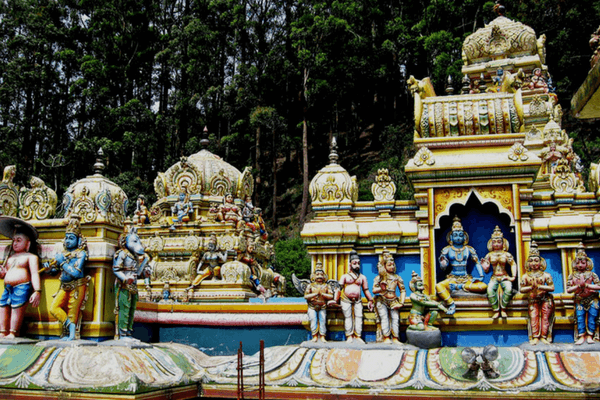 Here are some of the important places to visit in Sri Lanka that you can explore to learn this country’s importance in Hindu mythology. In Ramayana, Ashok Vatika is said to be the place where Sita was kept captive. This is also the place where Hanuman met Sita and later put entire Lanka on fire. Seetha Eliya is the name of this place today. This place is an important part of The Ramayana trail. Close to the resort city of Nuwara Eliya, the Hakgala Botanical Garden is the believed to be the modern Ashok Vatika. The much revered Sita Amman Temple is located here. Hakgala Botanical Garden is at the base of the Hakgala Rock forms. The Sita Pokuna is a strip of barren area over Hakgala Rock Jungle. It is the place where Sita was away from her husband Lord Ram. Near the Ashok Vatika, the site of Divurumpola is the place where Goddess Sita performed the fire test to prove her Chastity. Infuriated Goddess asked the Mother Goddess Earth to take her away from the world. Ravana was a highly intelligent king with the knowledge of ten Brahmins. To his folks, he was a noble emperor who worked towards the betterment of the life of people of Lanka. Today, many Hindus who come here for The Ramayana trail visit his temple. They visit this temple to offer their respect to the great king. Koneswaram Temple is above the cliffs at Trincomalee, a popular tourist town on the coast of north-eastern Sri Lanka. The natural scenic wonders of Trincomalee make it one of the most beautiful places to visit in Sri Lanka. 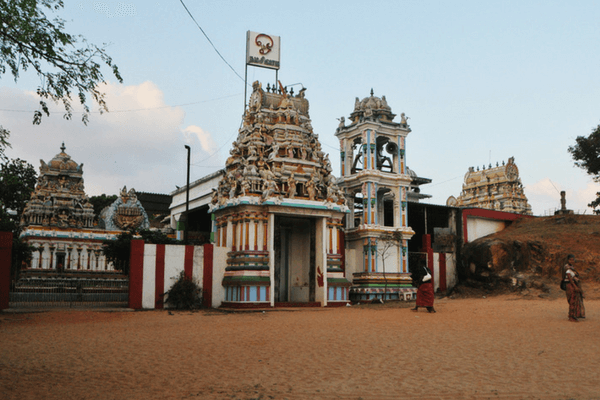 The architecture of this temple has drawn inspiration from the Pallava, Chola, Pandyan and Jaffna styles which shows proof of the multiple renovation processes of the temple throughout history. Ramayana talks of Ravana’s mighty aircraft, The Pushpak Vimana. It is said that Ravana had six airports with many other mythological flying aircrafts and chariots that he won from Gods and other kings in the battles. Thotupola Kanda is one of the six airports. After Ravana kidnapped Goddess Sita, he landed here. Thotupola Kanda is the third highest mountain peak of Sri Lanka and is a popular trekking spot. 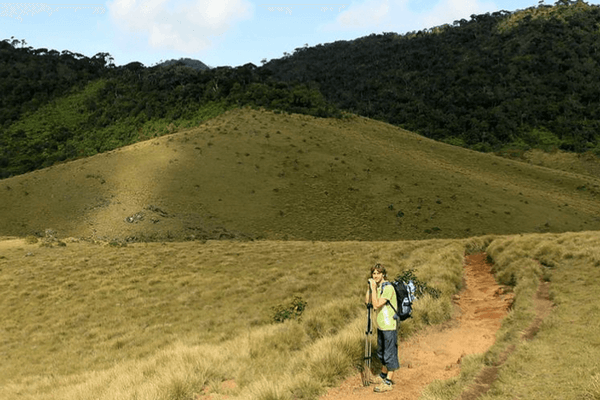 Hiking to Thotupola Kanda is one of the most adventurous things to do in Sri Lanka. After Lord Ram won his war with Ravana, he installed a Shiva Lingam at Manavari and seeked Lord Shiva’s blessings. It was built by Lord Rama. It is known as Ramalingam. 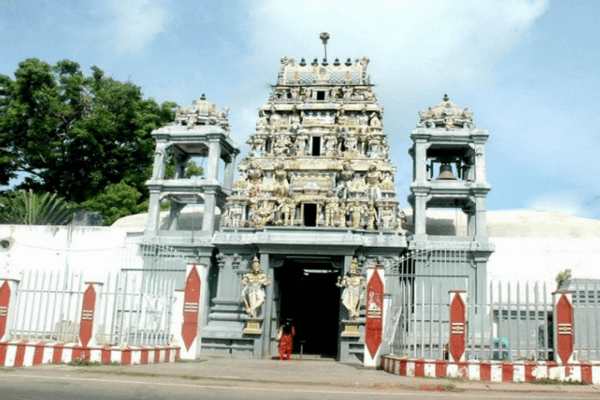 Manavari Temple is located in Chilaw, a town of great mythological importance and is one of the prime locations for The Ramayana trail. Known for its great food and ambience,Millions of Hindu tourists visit Chilaw every year. Munneshwaram Temple is a destination of importance to Hindu pilgrims. Rama was advised by Lord Shiva to build lingams for him to find penance from the curse of killing a Brahmin. It was on Lord Hanuman to bring the magical herb to save the life of a Lakshamana hit by fatal arrows. Confused, after not being able to find it, Hanuman decided to lift the mountain itself. Sanjivani drops are the chinks of the hill that have fallen at five places. One such place is Ritigala, a beautiful mysterious location filled with magical herbs and plantations of medical importance. Ritigala is the highest mountain peak of Sri Lanka. Other locations of the hill include Kachchativu Island, Thalladi, Dolukanda near Arankale, monastery and Rumassala. Of all these places Ritigala is believed to be one of the most sacred sites in Sri Lanka and the local believes that the yakshas here protect the plantations. This city is a UNESCO world heritage destination and one of the most sacred sites in Sri Lanka for The Buddhists. The main attraction of Kandy is temple of Buddha’s tooth. After Buddha’s cremation, his remains were took to eight different places. This temple keeps his teeth. Buddhist pilgrims visit this gorgeous town. It’s importance among the Hindu devotees is of equal. Sri Lanka tourism promotes this city of a multitude of interesting places. At a close proximity from Kandy, the Sita Kothwa is located. Goddess Sita spent the initial days of her exile in this place. 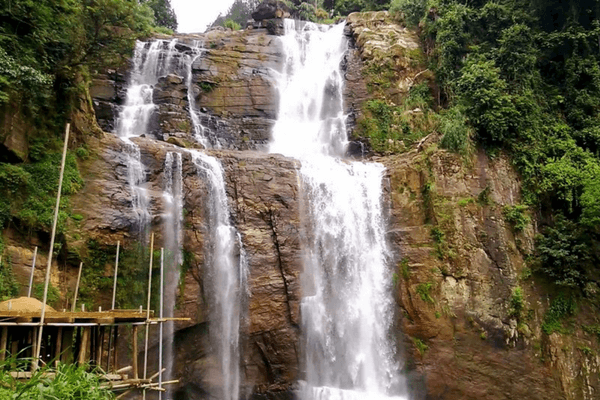 Beautiful lush green jungles and waterfalls fill this picturesque of a small village. Lord Hanuman started his search for Goddess Sita at this place. The quaint Bhaktha Hanuman temple here is a dedication to Lord Hanuman. Millions of devotees visit this temple on the occasion of The Full Moon. 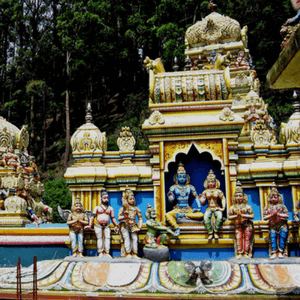 The Hindu community believes Ramboda as one of the prime religious sites in Sri Lanka. Sri Lanka is a drop dead gorgeous place. 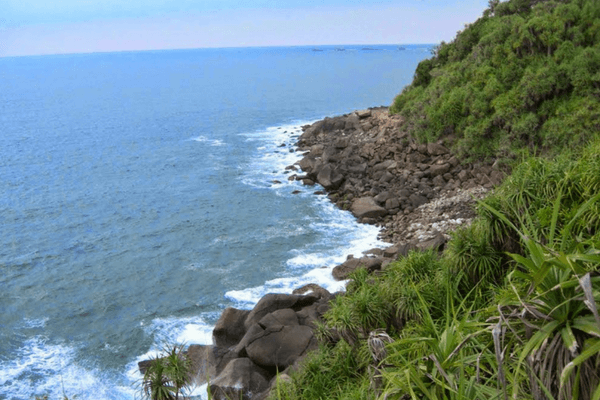 The amalgamation of mythology, history and the natural beauty makes this pristine island visited by a number of tourists who come here for backpacking, trekking and honeymooning. So come fall in love with this quaint little world called Sri Lanka. Traveling through Sri Lanka today, you come across many sites connected with the Ramayana trail. Plan your trip to Sri Lanka to know more.